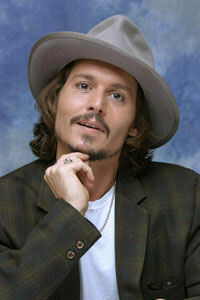 As is the standard procedure, I introduced myself as Depp offered his hand in greeting, "Hello, Mr. Depp. I’m from the Philippines," trying to shake off heavy drowsiness. Depp’s face lit up. "Kumusta ka?" he said, breaking into a wide, friendly smile, showing his gold-capped teeth (which, I would learn later, he decided not to be taken off so he wouldn’t have to put them back on for the shoot of Pirates 3 starting next month). That woke me up, as if from an REM dream. "Oh," I said, "you speak my language; you speak Tagalog!" 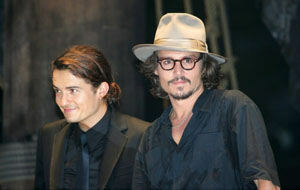 Smiling even more widely, Depp explained, "I was in the Philippines several years ago to shoot Platoon!" First thing I did during the interview break that Monday (June 26) afternoon was rush to the nearby Borders (my favorite bookstore, aside from Barnes & Noble) to buy a DVD copy of Platoon, directed by Oliver Stone. I watched the movie again before I wrote this Conversation and I must have blinked because I didn’t see even a shadow of Depp who must have been cast as one of the soldiers fighting the Vietcong; all I saw throughout the 120-minute war movie, set in Cambodia, were the main stars Charlie Sheen, Tom Berenger and Willem Dafoe. That was 20 years ago and I realized that Depp was a mere "extra" in the movie. Of course, things are different now. He has overtaken all the lead actors in that movie. The night before the round of interviews, I joined more than 50 other entertainment journalists from all corners of the world at the screening (a "must" for interviewers) of Pirates of the Caribbean: Dead Man’s Chest, a sequel to Pirates of the Caribbean: Curse of the Black Pearl which earned more than $654 million worldwide, making Depp an overnight box-office (read: highly-bankable) superstar. And to think that the movie, inspired by a fun ride in Disneyland, was predicted to be, like most of Depp’s previous films, a big flop! "I knew it would be a hit," Pirates producer Jerry Bruckheimer told Conversations. "I knew it from the very start." In Pirates of the Caribbean: Dead Man’s Chest, again directed by Gore Verbinski, Depp reprises his role as the dashing Capt. Jack Sparrow whom he portrays with a distinctive flair. It also stars again Orlando Bloom (more on him in a separate Conversation next Sunday) as Will Turner and Keira Knightley as his bride-to-be Elizabeth Swann. Depp didn’t come to the interview dressed as a pirate. He wore "bling-blings" (an assortment of bracelets—some made of cloth and the others of beads). "When I took note of (the "bling-blings"), Depp touched one of them and volunteered, "This is my daughter’s." Daughter is Lily-Rose, seven years old, one of Depp’s two children with long-time companion Vanessa Paradis, 33, a French actress-singer. (Depp’s past girlfriends included Sherilyn Fenn, Winona Ryder and Kate Moss.) Their other child, Jack, now four years old, was just an infant when Depp was nominated for a Best Actor Oscar for the first Pirates movie in 2003. The family lives in South of France most of the time. At the end of our Conversation, Depp asked, "How do you say thank you in Tagalog?" I told him, "Salamat po." Looking at me straight in the eye, he flashed another wide, friendly smile and said, "Salamat po!" What are your memories about the Philippines? We landed in the Philippines on March 2, 1986 to do Platoon. It was just days after Marcos had left the country and Corazon Aquino had taken power, and they were trying to figure out what to do with Imelda’s shoes. There were tanks in the streets. I’ve never seen anything like that in my life. It’s the first time I left the country . . . my first experience in leaving the United States was going into that. Pretty shocking! But I had an amazing time, you know. That was great—Oliver Stone plunging us into the jungle and we were living there in the holes for about two to three weeks. All in all, it was, as I’ve said, an amazing experience. Did you know that Corazon Aquino’s daughter Kris, the country’s top female TV host, is a fan of yours? When she learned that I was having an interview with you, she gushed, "My gosh, Johnny Depp is the most talented (Hollywood) actor today!" Oh, did she say it? How do you handle success and balance it with your personal life? In terms of success, or whatever, it’s still the same to me. You know, I was in a sort of cluster of movies which by Hollywood definition were ‘not successful’ or maybe even ‘failures’ or ‘flops’ or whatever they want to call them. To me, they were always successful because we got the job done. So, I don’t know . . . I don’t feel any different, just that more people seem to have responded to Pirates than any of my other movies. Your were nominated for a Best Actor Oscar for the first Pirates movie . . .
How did you react to that nomination? Oh, I was absolutely shocked—you know, completely shocked! The moment that it happened, I was doing the normal sort of routine in my house. I got up early with Jack . . . I go and make his bottle . . . the whole thing, you know. And then, I put on the television to go to the cartoon channels or whatever. At that very moment, they were just announcing the Oscar nominees. When they mentioned my name, I immediately got really violent with the remote control and surfed the cartoon channels. I was in a state of denial until I got the phone call confirming the news. So yeah, I was completely shocked. It didn’t make sense to me. I thought I made a mistake somewhere in the movie, so . . .
You are the perfect Capt. Jack Sparrow. Oh yeah, it’s a real honor because, you know, my kids can take their kids and their kids can take their kids to watch the (two) Pirates movies and they can still see me as I look now, and not the old man I will be, sitting before them. It is beyond me how such a character has sort of taken root in some people’s hearts. It’s still shocking to me. I was handed this opportunity to make something of this character, and I had pretty solid ideas about who he was and what he should be like. There were a number of people who thought I was nuts. But I was committed to the guy, and I think that’s what happened to me in terms of finding the character. What I set out to do was to try and make Capt. Jack Sparrow appeal to little kids as well as the most hardened adult intellectuals. I understand that Keith Richards of Rolling Stones was your role model for Capt. Jack Sparrow. You’ve played many memorable characters, from Edward Scissorhands to Gilbert Grape to a cross-dresser in Before Night Falls to Willy Wonka in Charlie and the Chocolate Factory, Ed Wood, Donnie Brasco and now Capt. Jack Sparrow in the Pirates movies. You really can choose the characters you want to play. I don’t know how one would explain it but somehow, I’m always kind of able to do that. I mean, it’s kind of a miracle. For example, being able to get jobs, you know, consistently throughout, let’s say the 1990s when, in the language of Hollywood, I was box-office poison. At the same time, I was still able to do every single film that I wanted to do with the filmmaker I wanted to work with. The characters that I was interested in were able to sort of fly under the radar to some degree—you know, doing things like Dead Man or Fear and Loathing in Las Vegas. To me, all those movies had some commercial potential and Pirates could just have as easily flopped, you know . . . it could have! Which of those roles do you closely identify with? I kind of identify with all of them. I think all of them sort of, uh, each of them is a piece of me and I’m a piece of all of them in a way. Is there a pirate in you itching for freedom? Being a pirate is tantamount to being free and free-spirited, isn’t it? Yeah. I think there’s a pirate in all of us. I think we all sort of dream of, you know, when we were kids we were dreamed of wanting to be pirates and that meant wanting total freedom—you know, wanting to answer to anyone. You have a way of turning any role into an acting masterpiece. How do you do it? Is there any technique, some kind of a formula? No, there’s neither rhyme nor reason, there’s no formula at all. It’s just, uh, for me I just kind of do my job. You know, there’s a process in which you search for the character and you try to find something that fits. You used to be called "Hollywood’s Angry Young Man." Now, you seem to be at ease with yourself and with the world. What has made you change, being a father or something? Yeah. You know, for me, I guess I just sort of went around for years and years, not quite understanding what everything was all about. Success or failure or money or this or that never made any sense to me, you know. It wasn’t until the birth of my first child did I have the opportunity to stand back and go okay. I understand things better now. Do you still have an aversion to stardom, to being a star? I just don’t see myself in that way, you know. I have an aversion to lies. The truth is, you know, I have a very good job and I’m lucky to have it and it’s kind of a privileged position at times. I don’t take things in some other way. Just because I do movies doesn’t make me more important or less important than anyone else. Speaking of movies, you’re now making family-oriented ones. Yeah, starting with Finding Neverland. The only thing I took into consideration regarding my kids for that movie was like, it was the guy who created Peter Pan, and it just happened to be a story that I was interested in. I thought it was a beautifully-executed story, sort of a biopic but not really a biopic; it was just kind of what happened, how he came up with the idea of Peter Pan. Other than Finding Neverland, the only other, as you said, ‘family-oriented’ movies that I’ve done were Charlie and the Chocolate Factory and the two Pirates movies. Orlando Bloom in an earlier interview described you as a "weirdo," jokingly of course. What’s your take on that? How do you like the idea of working with other actors like, say, Chow Yun Fat? I don’t really watch too many movies . . . I watch cartoons but not very many movies . . . but I’ve seen some of his works. I saw him in Crouching Tiger, Hidden Dragon and I liked him, so I was excited to work with him. He’s a very good actor. Yeah, getting into the ring with him must be nice, you know, just to sort of witness and experience how he works. But more than anything, it was nice to see that he’s such a charming actor, he’s like a little kid; a kind of sweet, playful little kid. I think the best word to describe him would probably be adorable. What do you enjoy the most about being an actor? You know, the key to fun is when you’re given the opportunity to be as irreverent as possible, and you can get in trouble for that. When I’m doing my homework for a scene, things come into the mind and I sort of incorporate them into my lines. It’s fun! But what’s even more fun is when you’re doing a scene and something happens . . . you know, that sort of magic, the magic of chance, a mistake when somebody forgets a line or you say a different line and it throws the whole balance and suddenly the floor is gone beneath you and everybody is sort of winging it for a second . . . That’s pure magic! And that’s when I’m having the most fun, you know. I want to end this Conversation on a lighter note. You’ve been called Sexiest Man Alive in 2003 by People magazine. How do you feel about it? That kind of thing is so absurd, you know. It’s like on one level you’re supposed to be flattered. But you know, you’re basically chosen by nice people who don’t spend time with you. I don’t take it seriously.